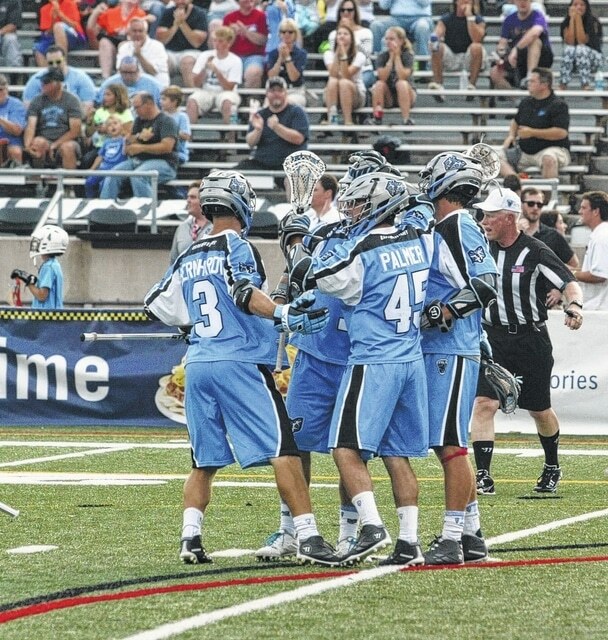 Machine players celebrate a goal during last week’s showdown against the visiting Bayhawks. They did plenty of celebrating Sunday, too, notching a 17-12 win over the host Rattlers. The Ohio Machine used five goals from Marcus Holman and an 11-goal first half to hold off an attempted comeback from the Rochester Rattlers and escape Eunice Kennedy Shriver Stadium with a 17-12 win on Sunday afternoon. The Machine (6-4) came out in the first half ready to avenge last week’s loss to the Chesapeake Bayhawks by scoring seven goals in the first quarter thanks to two apiece from Holman, Tom Schreiber and Jimmy Bitter. Bitter, who is playing in just his third game since joining the Machine after his senior season at North Carolina ended, was accompanied by Holman in notching a hat trick before half’s end. Greg Puskuldjian was able to win 11-of-17 first-half faceoffs in order to set the Machine up for success on the offensive side of the ball. While the first half featured an explosive offense that led the league in scoring just a season ago, it was complimented by a defense that held Rochester (5-5) scoreless for nearly 13 minutes of play. The Machine defense did more than stop goals in the first half when defenseman Brian Farrell fired in a two-point goal to help the Blue and White to an 11-5 lead headed into halftime. After outscoring Rochester in the first two quarters, the tables turned for the Machine in the third when the Rattlers netted five goals to two from Ohio, narrowing the Machine lead to 13-10 after three quarters of play. Holman was able to break the scoring drought for the Machine early in the fourth quarter when he fired in back-to-back goals to give him 29 on the season and five on the day. A two-point goal from Kyle Harrison with two minutes to go in the fourth quarter put the game away, giving the Machine the five-goal victory in Rochester. Brian Phipps was able to save 22 of the 34 shots on goal to help hold off the Rochester comeback. Next up, the Machine will head home to celebrate Independence Day in Selby Stadium next Saturday. Rochester visits Delaware to close out the back-to-back series.